Have you ever experimented with dim sum and wine before? Recently we were invited to Royal Canton to experience their inaugural Dim Sum and Wine Pairing luncheon.. and what a revelation it was! In collaboration with Delia Wines Sdn Bhd, diners will be guided through the 6-course dim sum lunch with premium French wine pairing by one of the owners of the wine company, Laurent Robert or Chaebok Kim-Robert (Sook). These wines have been specially selected through various food tastings, to complement the dim sum perfectly. To start, we had the delicate Har Gao and Chive Dumpling, paired with an equally light Domaine des Poncetys Saint Veran Les Climats 2016. 100% organic, this fruity Chardonnay goes well with prawn-based dishes. Made with finesse, we loved the plump dumplings with juicy prawns. 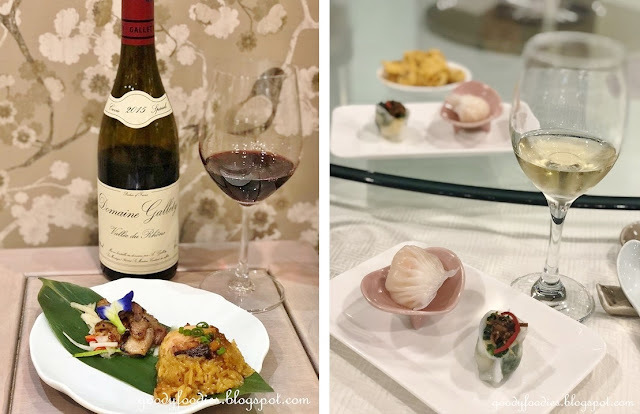 The Domaine Delobel Sauvignon Blanc 2016 was another organic wine selected to pair with the pork-based dim sum dishes - siew mai and steamed spare ribs. Our host, Sook would come around to explain about each wine and its tasting notes, and how best to pair the food with the wine, enhancing our enjoyment of the dishes in whole. The Enoki Mushroom Beancurd Roll and Crispy Sakura Prawn Cake - both deep fried dim sum items, were paired with the smooth, elegant Domaine de La Sangliere Cote de Provence Lalonde Rose 2016. Served with the Crispy bacon and fluffy Scallion pancake was the Chateau Ferthis Cuvee Ulysse 2015. This full-bodied red with notes of red fruits and spices pairs well with the sweet, sticky and spicy bacon. My personal favorite was the tender, flavorful Iberico Pork Neck served with glutinous rice paired with the intensely smooth Domaine Gallety 2015, which goes well with virtually any type of food. As a huge fan of Riesling, I loved the Domaine Rolly Gassmann Riesling Reserve Millesime 2014, served with the Mango Sago dessert. Lush and easy-to-drink, with an aromatic, zesty finish. 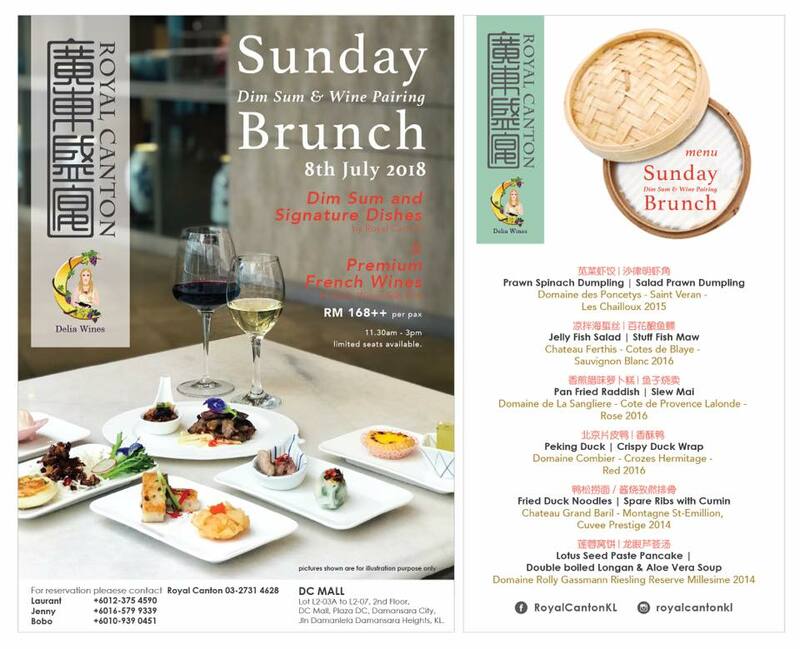 The dim sum brunch will usually be held on the first Sunday of the month (next one will be on 8 July 2018) at Royal Canton, DC Mall. Priced at RM168+ per person. Please call 03-2731 4628 to make your reservations. Next dim sum wine pairing will also feature Peking Duck! Royal Canton has also recently revamped their dim sum menu, with new additions such as XO sauce chives and prawns dumpling and scallion pancake. Dim sum is available daily (from 12pm on weekdays and 10.30am on weekends). See here for our previous review. Here's BabySumoKids enjoying some of their classics - the siew mai (RM9.50), fresh prawns and beancurd roll (RM9.50) and egg tart in puff pastry (RM10).